As I mentioned in Monday’s post, the events of my grandfather’s passing made it an interesting last two weeks. While this week has been rather therapeutic, last week was a mental test. We were visiting Kidd in Chicago and still were undecided of when to go home. We knew that things were progressing with my grandfather’s illness and it was just consuming the minds of my sister and I waiting until Wednesday when we were going back to Denver. I wasn’t sleeping very well and by that point was desperate for a distraction during the day on Tuesday. This is where Kidd was particularly helpful. My sister and her boyfriend had been living in Chicago for 6 months together before she was transferred to Connecticut. For the last 3 months, Kidd has been living alone in their apartment in Chicago. Despite the pictures on the walls and other trinkets of proof that a woman inhabited their apartment, Kidd’s refrigerator was about as bachelor pad as it gets: eggs, beer, and hot sauce. What does a chef with time and energy do upon seeing this? She makes a lasagna. Lasagna is that classic pasta dish that everyone knows how to make. I’m certainly not going to blow you away with new and inventive steps about how to make a lasagna. It’s slightly time consuming but is great for a large party or for freezing and saving it for a dinner or two. This version though is especially delicious and healthier- it’s open faced Bison, Spinach and Mushroom Lasagna. Bison is the best alternative for red meat choices, it’s tasty and lower in fat and cholesterol than ground beef. It has a slightly gamey taste like lamb does if you eat it as a burger, but if you aren’t into that it’s mostly masked in this dish. The bison is emphasized with meaty mushrooms, which add a nice texture to the dish. The cheesy layer isn’t all that cheesy, and is filled out with healthy spinach and lots of spices. Filling by itself and perfectly complemented with a nice salad if you choose. The perfect solution for my winding thoughts and Kidd’s semi-empty stomach. Fill a large pot with water and bring to a boil, boil the lasagna noodles for 7 minutes, or until they are al dente. Strain the noodles and rinse with cold water to stop their cooking. Set aside. Heat a large saute pan to medium heat with a tbs of olive oil. Saute the onions, garlic, and mushrooms for about 4 minutes, or until the mushrooms release most of their liquid and the onions become translucent. Add the ground bison and 1 tsp each of the basil, oregano, parsley, and herbs de Provence. Saute another 5 minutes or until the bison is cooked to a medium temperature. Add 1/2 of the crushed tomatoes, cover, and cook for 5 minutes. Remove from the heat and season with salt and pepper to taste. In a medium bowl, whisk the eggs and remaining 1 tsp of the basil, oregano, and parsley. Add the ricotta cheese, chopped 1/2 onion and garlic, and drained spinach; mix until everything is well incorporated. This is “the glue” of the lasagna. Mix 1/2 cup glue into the meat mixture. To assemble: spray a 9 x 13 pan with cooking spray. Add a shmear of the plain diced tomatoes to the bottom of the pan. Layer one row of noodles (about 4) to the bottom of the pan. Add the bison and mushroom mix to the baking dish, creating an even layer. Add the second layer of noodles to cover the meat and add another shmear of tomato sauce on top of the noodles. 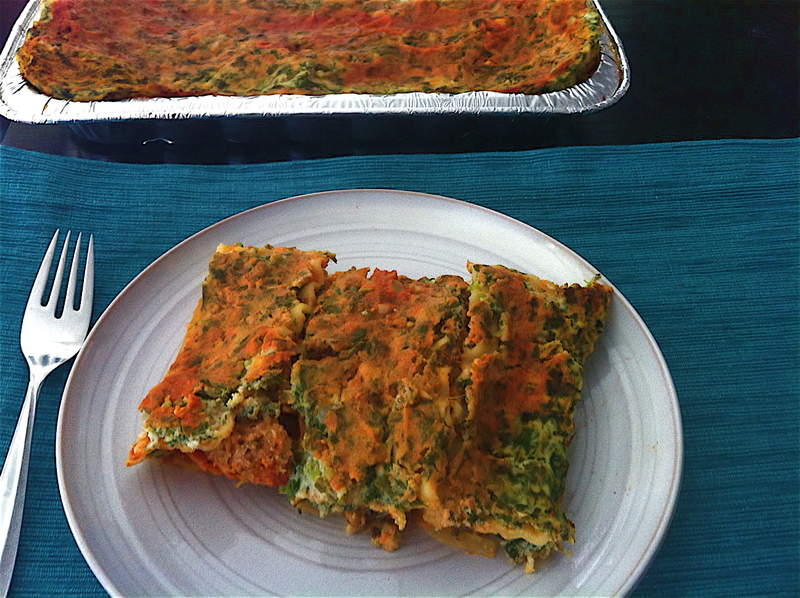 Add the glue (ricotta-spinach mix) to the next layer of the lasagna, creating an even layer. Add the remaining diced tomatoes on top. Sprinkle with Parmesan cheese if desired. Spray the bottom side of a sheet of foil and cover the lasagna. Bake in the oven for 1 hour. Remove from the oven and let sit for at least 10 minutes before serving.